I was just reading the article on the Mail's website earlier. I'm happy to carry on using them for our own use ... but am worried that others will turn up their noses at my cakes if I carry on using it after this furore. I only ever use a tiny bit, but I do love the effect ... Arrgh, what to do? Used the green glitter last year for Halloween cupcakes then read the packaging... Doh! Ended up scraping the icing off and re icing mainly because other people would be eating them. 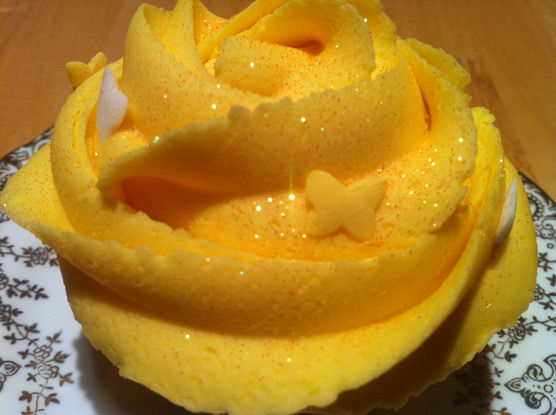 Happy to use the edible stuff but a bit nervous to use the non toxic glitter. Interesting blog. I will continue to use non-toxic glitter for personal consumption (because I love glitter! ), but not in my business (I only use true edible stuff, not the non-toxic glitter) because I don't want to give the impression to my clients/customers that I'm clueless about FSA rulings. I am quite shocked as to how many people who call themselves professional bakers seem oblivious to this FSA standard. A very well known cake maker still seemed to be using last month and nly at the weekend I saw a few stalls at Farmer's Market with cakes covered in the stuff. From a consumer point a view it makes me wonder what other FSA standards they are ignoring/unaware of. Yes it is non-toxic, but so is glass and plastic and I wouldn't want to be selling food with that on it. To be honest, I'm happy to use it on cakes for home consumption but I'd think twice now about using it on the ones I do for cake club or for our bake sales. It's not because I think it's dangerous, I just worry that others will be put off. I need to find a really good quality substitute! I bought some last year at a food festival and the bloke explained it thus: it says non toxic because it isn't a food stuff. But all that will happen is that it will pass through you. To be honest it became a bit of a joke in our house that we were going to have glittery poops. I mean, who doesn't want that?! I'm not concerned. I think it's a little h&s gone mad as its been used for years. I don't use it a lot & if I had a business I wouldn't use it. But I dont, so I do. Let's throw caution to the wind and embrace glittery insides!